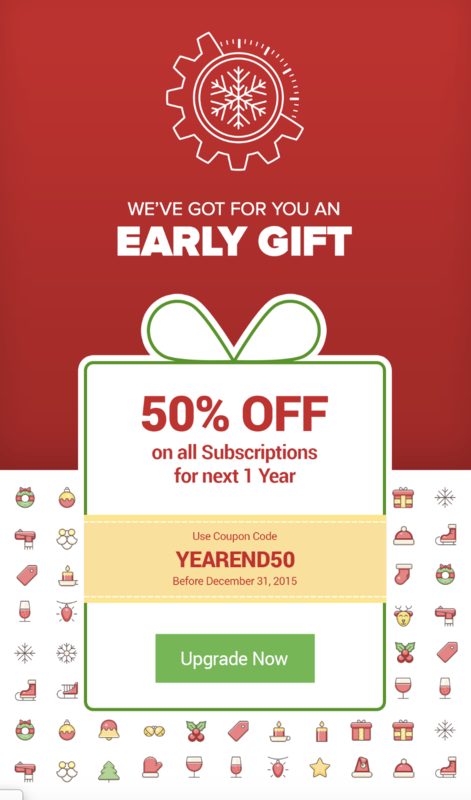 If you haven’t already planned your email marketing campaign for this holiday season, it’s time to get started. Email is one of the biggest drivers of revenue during the holidays — at least 20% of holiday sales according to Mailcharts. But consumers are going to be receiving thousands of emails this time of year, so you need to have a clear approach to stand out. It doesn’t have to be complicated — sometimes, a genuine holiday message is worth more than a fifth email about a sale. But it does need to be strategic. Want to learn more? Discover why this is such a great time of year for email marketing. During this period, your recipients will typically be in a good mood, wanting to show their holiday spirit by engaging with the brands/companies they’re loyal to. 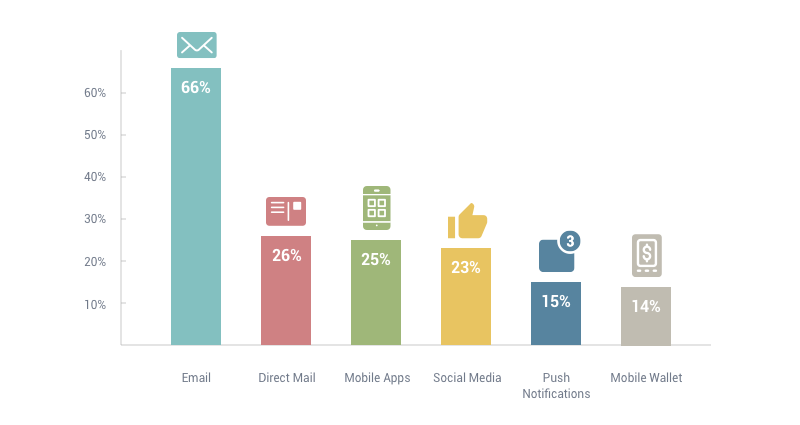 Email is already the channel that consumers are eager to use. A full 66% of consumers prefer to receive promotions and updates through email — far higher than direct mail (26%) or social media (25%). Your contacts are expecting you to get in touch, with more than half checking their personal email over 10 times a day. So, one of the best ways you can capitalize on their attention and get them to convert is to personalize what you send. Personalization goes beyond simply using a contact’s first name in the email copy. It involves segmenting audiences into lists based on your data and sending customized emails that apply to different contacts. The data you use to determine your segments will depend on which factors best define your buyers. Is it demographic information, like age or gender? Is it the type of product they’ve already purchased from you? Or is it a data point entirely specific to your business? For example, if you were a pet insurance company, you might have collected data on the type of pet your customers and prospects own. That way, you could send emails tailored to their interests. 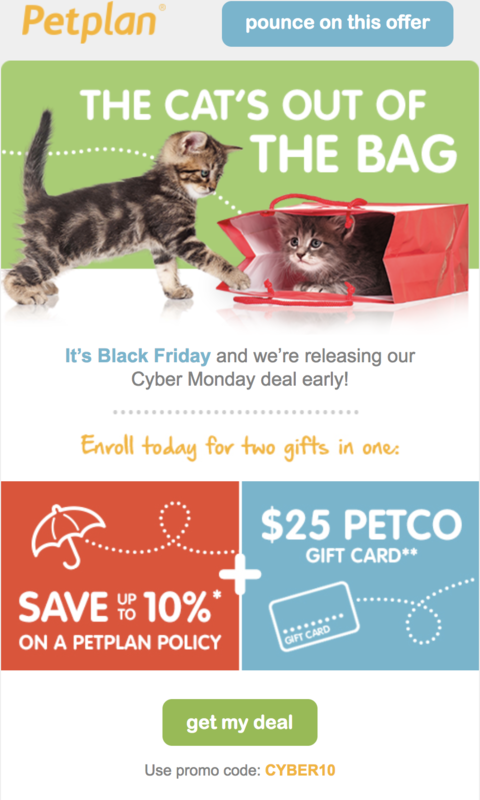 For example, this Petplan email below used photos and copy that best fit cat owners in advance of Cyber Monday. Going into the holidays and the new year, recipients are reflective and emotional. They’ll engage with offerings in their inbox that will make them a better person or make them feel good. Use an incentive to smooth out the conversion process — free shipping, free installation, a free demo, etc. Offer content that educates and provides value. A checklist, guide, infographic, and more can be used in email and other mediums to both provide value to existing contacts as well as collect new leads. Send a simple ‘thank you’ message. You might still generate some sales from it, but the goal is to keep in touch and make your contacts feel good. This email from Curate Labs is a perfect example of a simple holiday message. It acknowledges the rush of emails that contacts are probably getting and sets itself apart with genuine copy and signatures from the two founders. Sending holiday-related emails are a great medium to introduce any new value, offerings, incentives, etc. that your brand may want to convey, as recipients are more apt than any other time of year to take advantage of savings/promotions. This is one of the few periods of the year where nearly all of your contacts are expecting to spend money. Take advantage of this by capturing their attention with offers and promotions in email copy. When you showcase them in the subject line, it will drive opens as well — according to Campaign Monitor, discount offerings are one of the top reasons why consumers would open an email. This email from Configure.IT, a mobile app development company, showcases this perfectly. They built the entire email around the promotion and used extra holiday imagery and copy to place it in the season. There’s a few other techniques you can use to engage contacts once they’ve opened your email. One is to use urgency messaging, such as limited time offers or limited edition product lines. Prompt them to take action now. An effective way to showcase limited time offers in email is to use a countdown timer. 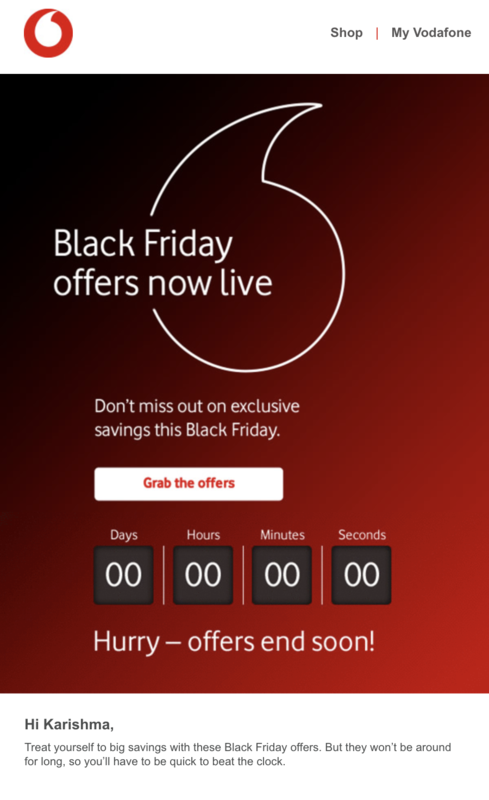 Let contacts immediately see the time that they have decrease — such as how Vodafone did this in their email before Black Friday. There are a number of ways that you can drive revenue this holiday season through email marketing. Your contacts are expecting you to reach out, and are willing to engage. But, if you want to make the most of your efforts, you need to carefully plan your strategy to help you stand out. Want to chat and see how your company could create an effective holiday email marketing strategy? Schedule a free consultation with our Director of Inbound Marketing Strategy, Kaitlyn Merola.